Man, oh man, was Q3 busy. We moved more than $130M, almost $50M more than in Q3 2014 (the same quarter in the last election cycle). Why the uptick in volume? We handled donations for over 4,000 campaigns, committees, and organizations as they made their way into the final stretch of an incredibly important election cycle. That’s a 33.9% increase over the number of groups using ActBlue in Q3 2014. What else is exciting? Compared to Q3 2014, we handled $20M more in recurring dollars, which is a whopping 172% increase. And recurring contributions made up more than one-fifth of our total funds raised. Read on to see how our sitewide fundraising compared to where we were at the same point back in previous years. Here’s the biggest news: as of Q3 2016, we’ve helped raise over $630 million in contributions. That means we’ve already nearly doubled the amount we raised in the 2014 cycle (2014 was a $335 million election cycle), and we’ve still got one more quarter to go in Election 2016. In the chart below, we break down the total number of campaigns, committees, and organizations using ActBlue by cycle. 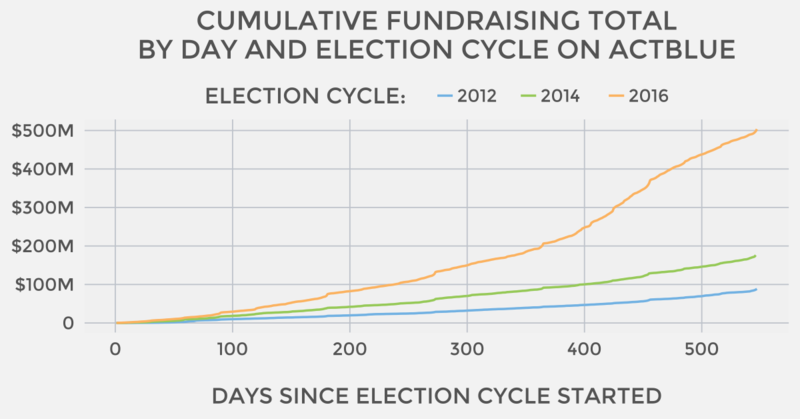 The vertical axis shows the running total for unique groups raising funds on ActBlue, while the horizontal axis represents the days in the cycle with the first day of each quarter as the labels. Look at that rapid growth in committees and orgs using ActBlue! Almost 6,200 different groups used our tools to fundraise in this election cycle, with over 4,000 active groups this quarter. We had almost 800 new candidates and groups sign up this quarter, which is huge compared to 560 new signups during this time in 2014 and 558 in 2012. This election cycle, we’ve expanded into new cities and counties. We’re working with a higher percentage of federal campaigns than ever before. And the best part is that we offer the same fundraising tools to candidates in school board races as we do to presidential candidates. We’re constantly innovating. We’re a one-stop shop where folks can give to all the causes they care about, at any level of government, no matter how big the race or how small the organization. In true ActBlue fashion, once we hit an exciting number, we have to keep upping the ante. 65% of our contributions this quarter were made via Express, and as of Q3 2016, we have over 3.2 million Express donors! And they’re an active bunch. In Q3 2016, we handled over $75 million in recurring contributions from folks who saved their information using our Express feature. As a quick refresher, our Express feature lets donors save their payment information with us and donate with a single click, making it easier for them to give (win, win). And in an election cycle like this where every dollar really counts, that efficiency and speed make a big difference in fundraising. In just two weeks, the number of new weekly contributions had surpassed the typical number of new monthly contributions. And let’s not bury the lede here: we handled more than 70k recurring contributions on September 30th. That’s the second highest total ever (surpassed only by February 29th when we ran recurring contributions from three days at once). In total, we moved $1.4M before 10AM that day — that’s a lot of traffic before most folks had even had their morning cup of coffee! Q3 before an election has historically been a big quarter (no surprise there). But this election cycle features seven out of the eight greatest quarter over quarter increases in terms of recurring donations. Back in Q3 2014, we handled only about a third of the recurring contributions we handled in Q3 2016. And in 2012, which was the last presidential election year, we handled less than $5M in recurring volume. That means we’re now raising over six times what we did in the last presidential election. Pretty cool. It was another strong quarter for giving on the go — 30% of the funds we raised came from a mobile device. And while people are definitely using mobile devices to do more, more often, we can’t chalk up the success of mobile giving just to time alone. We’ve also spent a lot of time optimizing for mobile. 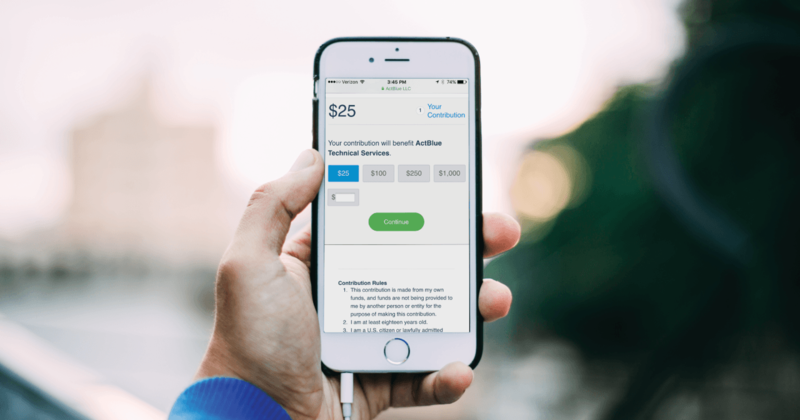 We tested and implemented a new feature: when mobile donors land on a form, they’re automatically taken past the contribution blurb to the part where they choose how much to give. With an increase of 5.2% in sitewide conversions (p < 0.05), that optimization has translated into real cash. We’ve also added an autocomplete search feature that populates your address on contribution forms, which has already started to boost our numbers. The goal with mobile is making it as easy as possible to give from a smaller screen, and that’s what we’re going to keep improving on. It was another busy quarter for our customer service team, who handled an incredible 28,490 calls and had 72,504 email conversations with ActBlue donors. At midnight on September 30th, the last day of the quarter, there were a grand total of zero donors waiting to have their emails and calls returned. Our team had squared away their emails and calls in real time! From folks who are giving for the first time and have questions about the process, to returning donors who want to check in about their contribution, our customer service representatives handle it all. They helped make the giving process as smooth as possible during this extremely busy quarter. In February 2016, we launched our remarketing feature. When enabled, it sends a reminder email to donors who have started but failed to complete a contribution after 30 minutes of inactivity. This quarter, remarketing helped bring an extra $420,000 in the door from over 13,000 contributions. In an election cycle where every dollar matters, that’s a lot more than just pocket change. But here’s the thing: only one fifth of our contribution forms sitewide that received contributions had our remarketing feature enabled. That means 80% of ActBlue forms are losing out on a lot of extra contributions! If you haven’t turned on remarketing yet, here’s a reminder about how to do it. It was an incredible quarter for ActBlue, and we’re so excited to have our biggest election year yet. That’s why we want to thank our donors! Without them, there’s no way we’d be on track to handle more than $700M this election cycle. We also couldn’t be more proud to be lowering the barrier for participation across the board. Our tools give folks who otherwise wouldn’t be able to get involved in the political process the opportunity to make real change happen. Of course, we’re also thrilled that the more new folks start using our tools, the more fundraising records we can break. After all, let’s remember our prediction back in Q1 2016: we said we might process over half a billion dollars in small-dollar contributions this election cycle: looks like we’ve got some ceilings to smash both in terms of our own record, and in the White House. We’re less than two months from the election. It’s definitely crunch time, and the need for resources has never been more critical. Our answer? Weekly recurring. It’s a great tool that helps campaigns and committees bring in more donations during these tough last few weeks when the pressure is really on. Just as it sounds, weekly recurring gives donors the option to sign up and make a recurring contribution that processes on the same day of the week, every week, until November 8th. After Election Day, the recurring contribution automatically deactivates. 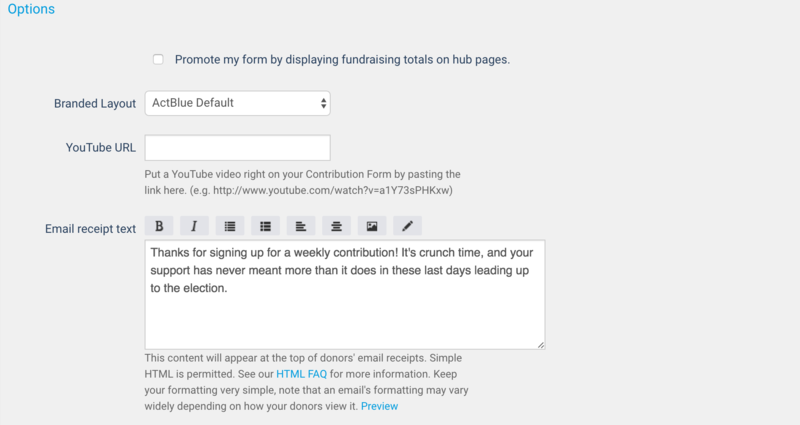 It’s important to note that we can only turn weekly recurring on for your forms if you’re using ActBlue to fundraise for both your emails and website. So if a donor signed up with a recurring contribution today, they’d be making 7 contributions that would each be scheduled to process on Thursday. If you’re interested in turning on weekly recurring, shoot us an email at info [AT] actblue [DOT] com with the forms you want it turned on for. If you decide you want to use it on more forms in the future, you can just clone a form that already has weekly enabled. Don’t forget that you can use pop-up recurring for weekly contributions! But make sure you change the ask language and note that it’s a weekly recurring contribution. We also recommend putting some time into figuring out how to make the right asks of the right folks. When we’ve tested our weekly recurring feature, we’ve found that people who are more likely to sign up for our usual monthly recurring ask are also more likely to give weekly. Conversely, folks who are more likely to give to a one-time ask are less likely to give on a weekly basis. Another test we had great success with was our ‘7 for 7’ ask, where we asked donors to give $7 for the last 7 weeks before the election. But it’s important to remember that every list is different. 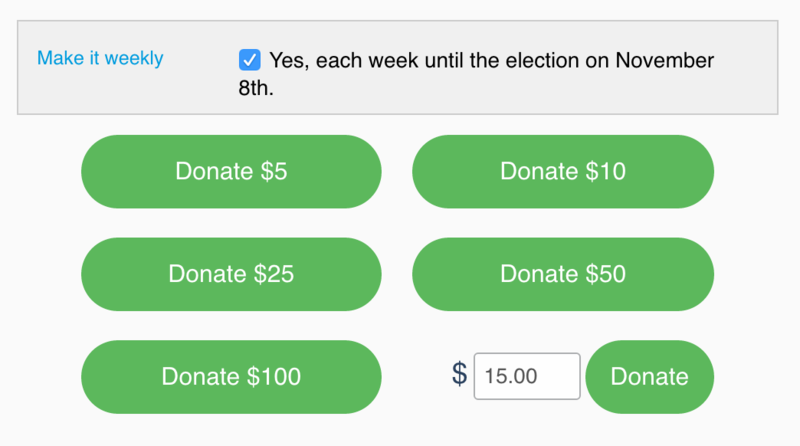 Weekly recurring is a great way to keep your donor base engaged with you up until when it really counts: Election Day. We’re thrilled to bring you this option again, and would love to hear about any tests you run that are particularly successful. If we’ve convinced you to get set up with weekly recurring, let us know at info [AT] actblue [DOT] com and we’ll turn it on. Q2 2016 was strong; back in Q2 2014, folks using ActBlue’s fundraising tools had raised just shy of $48 million. For this quarter, we’ve passed $130M! Talk about an exciting upwards trajectory. Q2 2016 had 2.8 million more contributions than Q2 2014. That’s more than 200% growth. Donors contributed to 3,753 different campaigns, committees, and organizations. Our average contribution size has shrunk a little, because of the impact of repeat donors. The average contribution size for new donors was $55, compared to $30 for donors who have given previously. 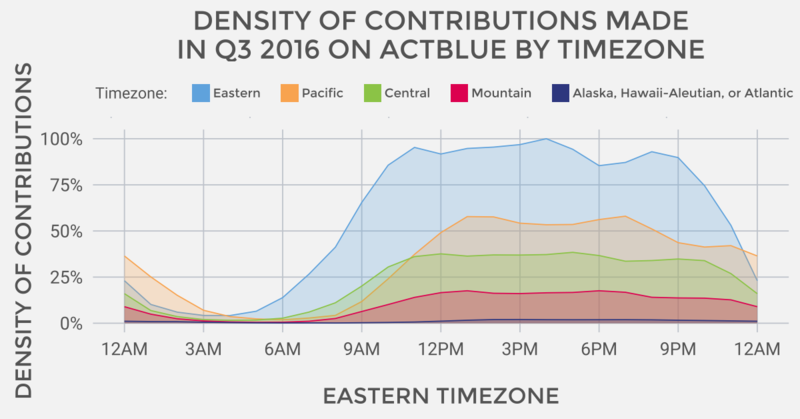 More than 1.2 million unique people made a donation on ActBlue in Q2 2016, and, of those, 80% made more than one contribution. That’s only the second time that at least one million individual people have given in a single quarter on our platform. During Q2 2016, we hit another major milestone: over $500 million raised via ActBlue for this election. For context, the combined total raised for the 2012 and 2014 cycles is $517 million. It took the entire 2014 cycle to raise $335 million and just over 15 months to reach that total this election year. Our number crunchers had been predicting our total for the entire 2016 cycle would be $500 million. But now we’re more likely on a path for something around a $700 million cycle. The graph below breaks down our top-line stats further (and says it all): Express contributions have increased from less than 10% at the start of the 2012 election cycle to 70% of all donations this past quarter. The mobile contribution rate has hovered around 40% the past two quarters, which is about double the rate for the same points in the last election cycle. 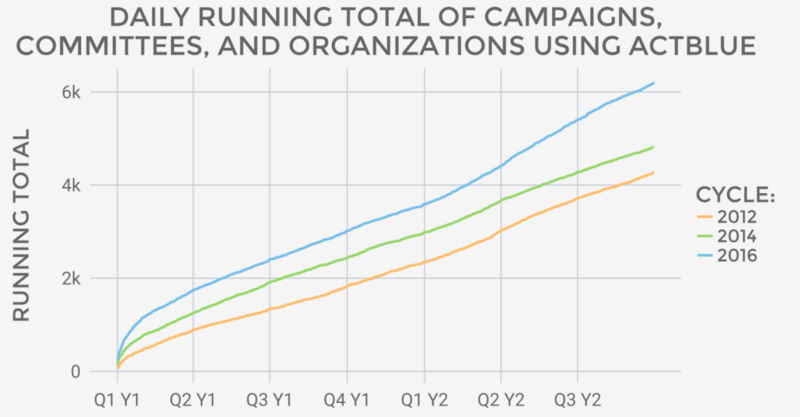 Recurring as a share of the total fundraising volume tends to fluctuate more than the other two metrics within a cycle. If you look just at the 2016 election cycle, percent recurring volume has landed in the 15-28% range each quarter. Our Express feature, which allows donors to save their payment information with us, helps donors give (literally) with just the click of a button. The majority of our 3 million Express users have signed up this cycle. Because it’s easier for people to give when they don’t have to spend time entering in their address and credit card information, they’re more likely to go ahead and contribute. In Q2 2014, we raised about $28 million from Express contributions. Fast forward two years, and we’re at almost $83 million raised via Express for the quarter. And I know we mentioned it earlier, but it’s too stunning a stat to only say once: Express contributions now make up an incredible 70% of our total contributions. Plus, with 4 million contributions overall and 1.2 million unique donors during Q2 2016, it’s clear that we’re getting a lot of repeat givers thanks to the overwhelming success of our Express feature. This time last cycle, 14% of our contributions were recurring. Now, that number’s at almost 42%. Why the increase? Recurring donations work well for both the fundraiser and the donor as an easy way to make regular contributions, providing a stable fundraising base. Plus, we’ve been helping lots of campaigns and organizations figure out a recurring donor strategy. 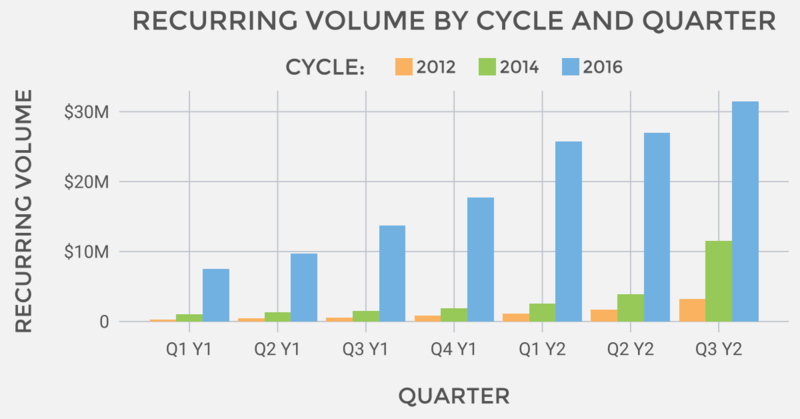 The chart below shows the incredible growth we’ve been seeing in recurring, particularly from Q2 2014 to this quarter. The spikes on the chart below are the last days of each month. That’s when we see the highest number of contributions. The typical daily recurring volume in Q2 2016 was significantly higher than even the busiest days in previous second quarters. When we look at the last days of each month this quarter, 2014 and 2012 are left totally in the dust. One of our favorite features, weekly recurring, will be back at the end of this current quarter for some groups using ActBlue. Our team can turn on weekly recurring six weeks ahead of the election. It’s a great way to get donors excited and primed for Election Day, and to raise critical cash for your cause at the most important time. If you’re interested in learning more about how weekly recurring could give your campaign a boost, start planning your weekly fundraising strategy now. We’re more than happy to help brainstorm with you. We expect to have some big Q3 news about exciting new innovations in recurring giving, and our engineers are hard at work. Stay tuned and excuse our vagueness, but watch this space! 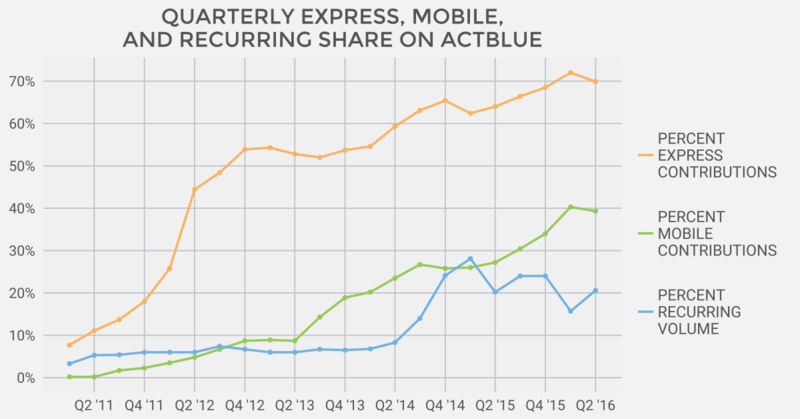 In Q2 2012, just 5% of contributions through ActBlue were made via a mobile device, and that number grew to 24% in Q2 2014. This quarter? Almost 40%. We’ve broken down the mobile percentage day-by-day for Q2 2016 so you can visualize how it changes over time. 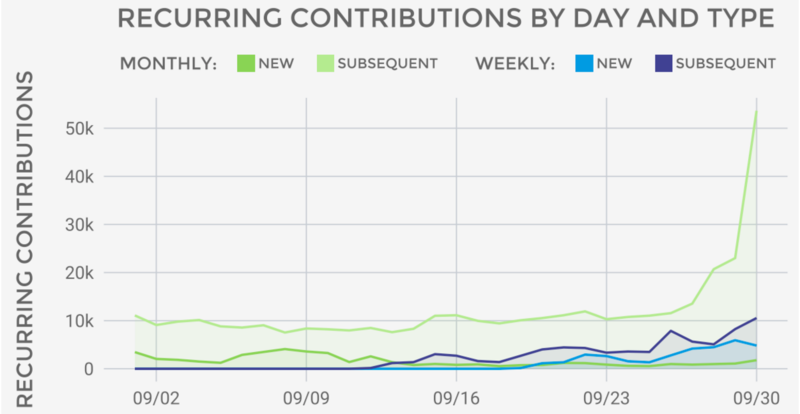 Notice the spike in mobile contributions towards the end of the week and on weekends. Saturdays and Sundays were peak mobile days throughout the quarter, and it’s likely that these are times when people are less tethered to their computers, which is why they do more of their giving from mobile devices. We can’t really take credit for the popularity and spread of iPhones and other mobile devices, but we can take credit for optimizing our forms for mobile. Our high contribution volume affords us lots of space for A/B testing and optimization. Plainly put, we have the best mobile experience in nonprofit and political giving out there. Our mobile contribution rate speaks for itself. Our customer service team is working hard to make sure donors always have a good experience, so that the organizations and campaigns who use our tools can focus on doing the organizing. Inquiries are always a percentage of volume, and for Q3 2016, we expect volume to go up, meaning our CS team will be even busier than this past quarter. As we get ready for one of the most critical elections of our lifetime, time will be of the essence, and campaigns will need to use every dollar they’ve raised as quickly and efficiently as possible. To handle the traffic, we’ve expanded our customer service team so that there are folks always ready to answer questions and resolve issues as quickly as possible. And we’ve intentionally staffed up to have more coverage in the evening and weekend hours to be as responsive as possible to donor questions. We launched our remarketing feature in February 2016, which reminds donors about a contribution they’ve started to make but haven’t completed after 30 minutes of inactivity. In Q2 2016, contributions from remarketing totaled more than $500,000 — all campaigns and organizations had to do was turn the feature on form-by-form and our infrastructure took care of the rest. Find out how to turn it on here, if you haven’t already. Almost half of remarketing contributions are made from mobile devices. The average monthly mobile contribution rate for remarketing is 9 percentage points higher than the sitewide average. We thought this stat was interesting, and have more than a few theories that might explain it. What we know for sure is that when donors get that remarketing email, we’ve tracked where they were in the giving process, so all the information we know about them has already been pre-filled. And that makes it really easy to complete a contribution, particularly on a mobile device. Shifting people from desktop to mobile during the giving process also means that donors will have their information stored on multiple devices, reducing friction the next time they want to give. And that is a great thing, my friends. Where are donors based? It’s on every email fundraiser’s mind. We ran the numbers for contributions made using ActBlue and came up with the chart below. As always, keep in mind that every individual list is different. 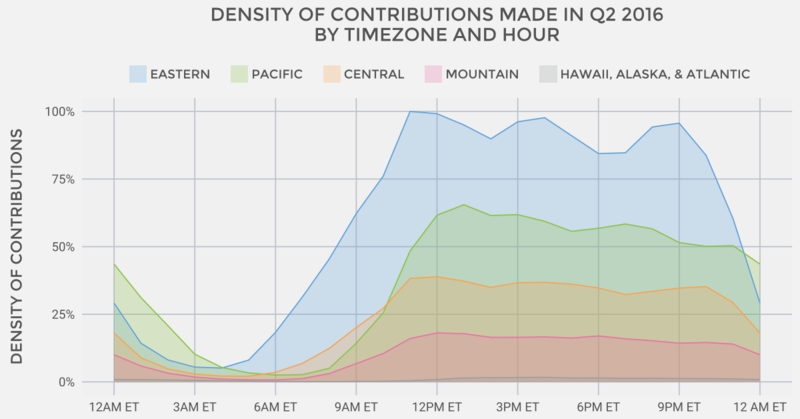 One last fun fact we pulled from this dataset: West Coasters in the Pacific time zone made more contributions per donor on average (3.84) than in any other time zone this quarter. So, there’s a little more green in that chart than if they had given at the same rate as the combined category that includes the Alaska, Hawaii-Aleutian, and Atlantic time zones, for example. One of the most exciting things about this quarter was how even without presidential traffic, we’re running at nearly double the last election in terms of funds raised. And of that non-presidential volume, over 15% was raised in just three days this quarter: the last days of April, May, and June. As we move into the general election, we’re expecting the amount of contributions we’re processing to rise, particularly at the end of each coming month. Q3 2016 will likely be a record-breaker. The only question: Just how big will it be?